St Hilary Pottery was started by Jess Val Baker when she and her husband, the author, Denys Val Baker lived at the Old Vicarage in St Hilary. This was previously the home of Father Bernard Walke, writer of the classic book on 1920’s and 30’s Cornwall ‘Twenty Years at St Hilary’. Inspired by their friends Anthony Richards and Len Missen who ran the Penzance Pottery, Jess took pottery lessons at the Penzance Art School tutored by Michael Leach, son of Bernard Leach. As Jess became more adept at potting, they bought a wheel and Denys built a kiln. Soon Jess was asked to make pieces commissioned by friends and acquaintances. Denys travelled around to obtain orders from shops in Cornwall and together they built a small pottery business. 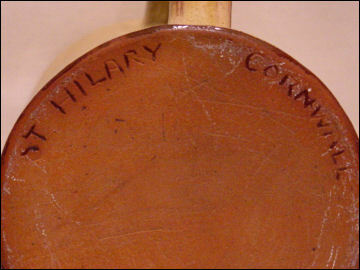 Denys started to get orders for customised pots that needed more skillful decoration than Jess was able to provide. So Donald Swan, the artist and illustrator, helped out by adding artistic decoration to Jess's pots. Being an artist, Donald was rather meticulous at doing the more elaborate pictures and often had to work late into the night to complete an order. Later the decoration was done by Bill Picard who went on to start the Mousehole Pottery with his wife Biddy. 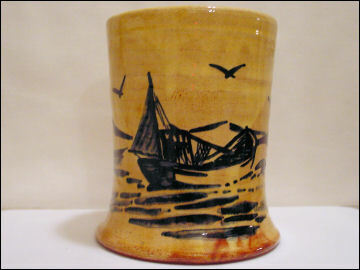 Donald Swan later started the Castle-an-Dinas Pottery with his wife Elizabeth. Pottery making at the Old Lodge finished when Denys and Jess moved to Kent. They returned to Cornwall in 1957, this time settling in St Ives. Jess then established the Mask Pottery and, a few years later, Millstream Pottery at Fowey. 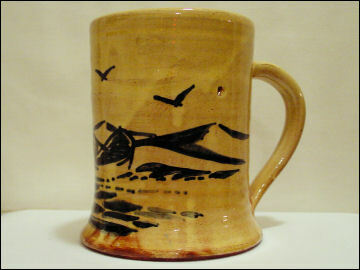 Tankard thrown by Jess Val Baker and decorated by Donald Swan. Detail showing fishing boat and seagulls. Mark on the above piece.